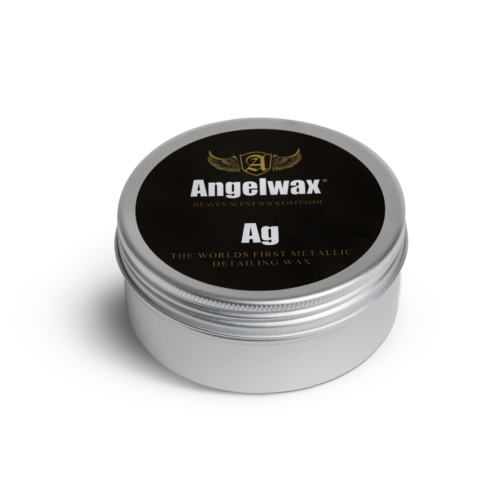 Angelwax Ag is the worlds’ first, hard metallic silver detailing wax and is made with the same chemical components that are used in the manufacture of silver vehicle paint. Designed and formulated to enrich silver paintwork, Angelwax Ag adds depth and lustre whilst masking swirls, light scratches and minor stone-chips making this highly durable wax a ‘must have’ detailing product for owners of silver vehicles. Available in 150ml and 33ml sample tins. 1. Ensure that the surface to be treated is cool, clean and well prepared before application and that the area to be protected is free from traffic film, tar and other contaminants. 2. Apply Angelwax Ag sparingly with a clean, dry wax applicator to one panel at a time. 3. Leave the wax to cure for a few minutes. 4. Remove with al clean, dry microfibre cloth.